Hosted by Jeff Waters of ANNIHILATOR, Jamming With Waters In International Waters – the official 70000TONS OF METAL™ All Star Jam – once again wrote a new chapter in Heavy Metal History when a spectacular lineup of the musicians on board 70000TONS OF METAL™ 2017 teamed up to perform classic Metal Anthems! 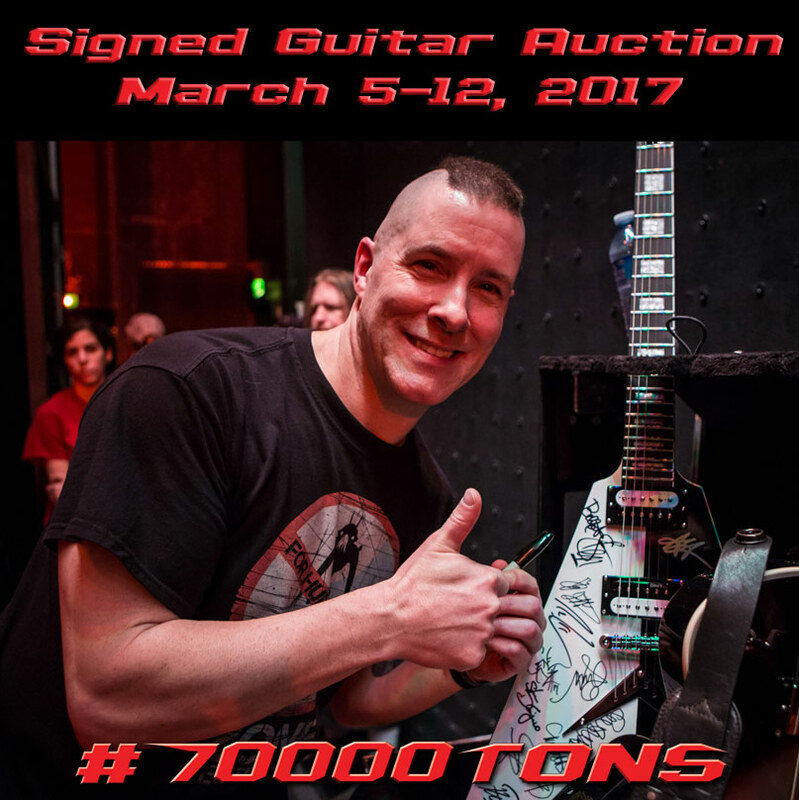 Prior to sailing there was a lot of online discussion amongst Sailors about what they could do to provide aid to those in need in Haiti, which inspired the crew at 70000TONS OF METAL™ to make our own contribution – we will be auctioning off a very unique Michael Schenker 2004 model Dean Guitar. This legendary axe was signed by most of the world class artists who participated in the jam: Elize Ryd (AMARANTHE), Esa Holopainen (AMORPHIS), Jeff Waters / Fabio Alessandrini / Rich Hinks / Aaron Homma (ANNIHILATOR), Charlie Benante / Frank Bello / Scott Ian (ANTHRAX), Ben Ash (CARCASS), Mark Osegueda / Will Carroll (DEATH ANGEL), Lisa Cuthbert (DRACONIAN), Jon Gallagher (DYING FETUS), Van Williams (GHOST SHIP OCTAVIUS), Axel Ritt (GRAVE DIGGER), Bobby Blitz (OVERKILL), Per Nilsson (SCAR SYMMETRY), Fabio D’Amore (SERENITY), Rich Ward (STUCK MOJO), Alex Skolnick / Steve DiGiorgio / Gene Hoglan (TESTAMENT), Thomas Vikström / Linnéa Vikström (THERION), Russ Bergquist (TOUCH THE SUN), and Steven Wussow / Philip Restemeier (XANDRIA). All proceeds from the auction will be donated to the people of Haiti via Direct Relief. Direct Relief is a non governmental, nonsectarian, and not-for- profit humanitarian aid organization with a mission to improve the health and lives of people affected by poverty or emergencies by delivering medicines and medical supplies to people in all 50 U.S. states and in 80 countries. Since 2010, Direct Relief has provided over $204 million in critically needed medical aid to over 200 healthcare facilities and organizations caring for Haiti’s most vulnerable communities. For more information about Direct Relief please visit www.directrelief.org. For more information and to submit your bid, please visit this location.